The other day someone asked me how many times I revise my novels. I had to laugh because I tend to lose track around draft 8. Then she went on to ask me what my revision process involved. Now for that, I have four distinct stages I take my novels through. Each of those stages takes time and I might have to repeat all 4 stages after my critique partners review the project. 1. First draft (where I just write the story down)- This is the stage I just finished. And believe me, the novel is a complete disaster. I liken it to a tsunami. I suppose it’s because I’m the kind of writer who needs to lay it all down and then sift through the rubble. And I like to write this draft as fast as possible while I’m in my character’s head. 2. Plot development draft– This is where I work the kinks out of the plot and weave the disjointed events so my readers get their “ah ha” moments. I think of this stage as a giant puzzle. 3. Character development draft– In this draft I focus on fine tuning my characters. This is where I bring them to life and hone out their internal and external conflicts. 4. World building and making all those words look pretty draft- I’m a sucker for pretty language. Not too much that it distracts from the story, but enough that it captures the mood and atmosphere of the world I’m building. This is the draft where I have to focus on details. 5. Grammar and spelling (groan)- yep, I hate spelling. I know I’m a teacher and I’ve got spell check but I still hate it. How about you? What part of the revision process do you really focus on? I like the way you separate out different aspects of the writing, so you’re not trying to do it all at once. That’s where I run into problems with revising – I have an obsessive need for it to “sound right” at all stages. I need to learn to focus only on one aspect at a time. Actually, your stages, plot, character, language, remind me of the key elements of a novel I read about recently at Marcia Hoehne’s blog. I’m still finding my grove, though I think I’ve finally got it figured out. After reading a book on subtext, I went through my ms and focused on that element. I’ve also gone through the ms to focus on emotion after finding some brilliant notes on how to push mine further. So basically, every time I find a great craft book, I take my ms through another draft. Interesting to hear about your process. Thanks for sharing! I find, like Andrea, that it’s hard for me to separate out individual elements. I like to have things right going forward. I also start my revision with fixing plot, but with plot so intrinsically connected to character motivations, I ended up playing with those, too. Then I might do a run through worrying about characters, but end up changing the plot. Then back to worrying about plot… With the current wip, I’m working on individual sections of about 10K, and trying to get those right before I move on to other issues. I guess, if I had to generalize, I’d say I work from issue to issue, rather than plot, character, setting, etc. Loved this post! I especially like how you describe the first draft like a tsunami disaster, it captures my feelings perfectly. 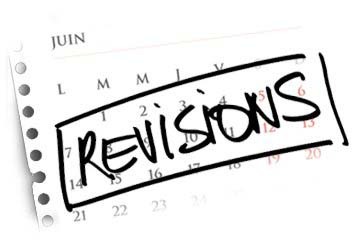 I find you capture all the major aspects of revisions quite plainly, it actually has me thinking about a revision method.